Washington Square Press, 9780671040734, 208pp. Born into a world ruled and defined by the cocktail hour, in which the solution to any problem could be found in a dry martini or another glass of wine, Susan Cheever led a life both charmed and damned. She and her father, the celebrated writer John Cheever, were deeply affected and troubled by alcohol. Addressing for the first time the profound effects that alcohol had on her life, in shaping of her relationships with men and in influencing her as a writer, Susan Cheever delivers an elegant memoir of clear-eyed candor and unsettling immediacy. She tells of her childhood obsession with the niceties of cocktails and all that they implied -- sociability, sophistication, status; of college days spent drinking beer and cheap wine; of her three failed marriages, in which alcohol was the inescapable component, of a way of life that brought her perilously close to the edge. 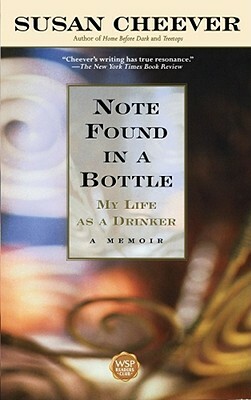 At once devastating and inspiring, Note Found in a Bottle offers a startlingly intimate portrait of the alcoholic's life -- and of the corageous journey to recovery. Cheever's writing has true resonance. Engrossing and remarkably devoid of self-flagellation. From this beautifully written book, it is clear that the dull haze of alcohol never obscured Cheever's writerly instincts....A writer of shining clarity. It's a testament to Cheever's skill as a memoirist that her slow dawning becomes ours. Like her, we expect some cataclysmic event, some aha! moment....Instead, she and we get a slow accumulation of behaviors that, in sober hindsight, add up to an alcoholic life....A major accomplishment. A memoir that floats like a sad song, with its themes the effervescence of champagne and the flatness of the morning after....A poignant and fortright tale of a rugged journey by amd extraordinarily gifted writer. Out of razor blades and rosebuds, Susan Cheever has fashioned a stunning story of spiritual rebirth. It breaks your heart while it makes you laugh out loud. I plan to read it again and again. Brutally frank....A powerful story written in precise, emotionally intense prose. Anyone in recovery runs the risk of sounding self-pitying, self-righteous, or both. The middle ground is hard to achieve with material so personal....Susan Cheever, absent pathos or bathos, has now walked that fine line. The realm she evokes here may look at first like paradise, but by the time you finish these beautifully imagined pages, you'll be convinced it was hell....It's Cheever's strength that she can write through this form, making us see the shimmering, layered reality behind any moralizing. Cheever's compelling, candid, and ultimately inspiring story is a testimony both ot her personal triumph and her undeniable gift as a writer.